Receive personalized service by professionals who recognize the value of your real estate investment. 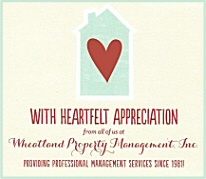 Wheatland serves as the managing agent for numerous homeowners associations in the area. Our management services enhance the ability for "maintenance provided" communities to operate in a professional and business-like manner by assisting their elected leadership in fulfilling the obligations set forth in their governing documents. In our role as managing agent, Wheatland interacts with the associations' elected leadership to communicate and implement their Board decisions. The ultimate responsibility for maintaining a "maintenance provided community" is that of all the members of the community who contribute through equal participation in dues and special assessments. The level of participation by the membership dictates the quality of services that can be provided. Each community is unique; therefore, our services are customized to meet the specific needs of the association and fees correspond to the level of service provided.